Do vanilla fences just not cut it for you anymore? Fence Overhaul aims to address qualms with vanilla fences by adding new ones. Because Fence Overhaul doesn't just replace the vanilla fence, many awesome things can be built with a combination of vanilla and improved fences! This mod currently only adds diagonal fences, but many more fence-based improvements are planned / in development. The names and crafting recipes are subject to change. Will this mod continue and move forward with 1.11 ( possibly 1.12 since its im sure right around the corner from being released ) just curious thanks! Are we gonna see a 1.11 version? 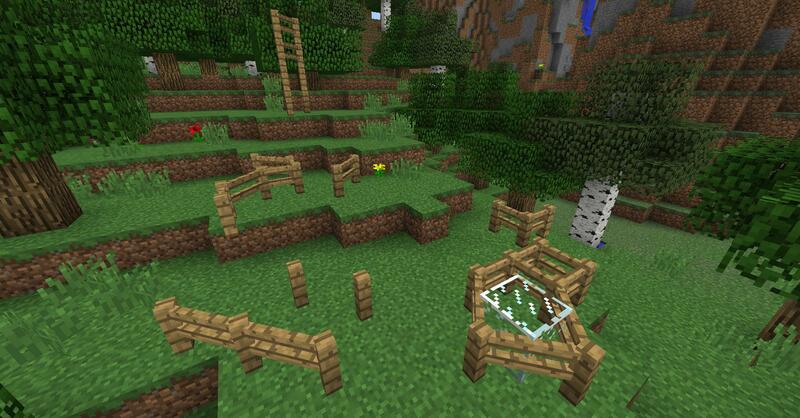 can you tell me how do i change or add the texture to this mod.. Or get this mod to use the current resource pack? EDIT: i hope you dont mind me asking you this.. if you dont like it because it could pressure you, please let me know..
when will there be API added to this mod so diagonal fence can be used with other mods.. like forestry or Biome O plenty so on and on? but i preferred to use Biome O plenty. EDIT: never mind about the texture pack... few things had fooled me regarding the texture for fences.. so its fine and no problem. This mod creates what amounts to a hidden dynamic resource pack that is generated by deriving model resource files from templates (which are provided by non-dynamic resource packs or by the mod itself if none are overriding them). Of course, if a resource pack provides the actual model files, then the generated ones don't need to be used. The normal templates are contained within the mod's jar in the 'assets' folder. The "FenceResourceGenerationLogic" file specifies what files to use as templates and how to save them back out. "%type%" is replaced with the block's type/material name for models, while "%texture%" is replaced with the standard default texture that the fence is registered with in the code (which is the texture of the normal fences/wooden planks in the default resource pack). The API is about done, but I want to change the mod to use metadata so that more fence improvements can be added without needing to add more Blocks/Items (using up IDs, I mean). Will there be some backport to 1.7.10? A backport to 1.7.10 is unlikely, since this takes advantage of the BlockState model json stuff added in 1.8.